Tom Clancy’s The Division is looking to be a big hit come March, promising to satiate gamers’ desire for shooting, looting, and levelling. The Division‘s open world recreation of New York City boasts plenty to see and do, and on PC that massive amount of content will appear more detailed, be rendered at up to 4K, and be enhanced by NVIDIA GameWorks HBAO+ and PCSS visual effects. Enabling these and other effects at higher resolutions will require serious pixel-pushing prowess, so for many an upgrade will be in order. For the Beta and the official release of The Division, Ubisoft is recommending players use the NVIDIA GeForce GTX 970, which will provide the performance for high-detail, high framerate gameplay. NVIDIA have their own recommendations and testing available in the near future too. From today, if you upgrade to a GeForce GTX 980 Ti, GeForce GTX 980 or GeForce GTX 970 graphics card or system, or purchase a new GeForce GTX 980, 980M or 970M notebook, you’ll receive a free downloadable copy of Tom Clancy’s The Division, giving you the keys to a digitized and dilapidated New York City. 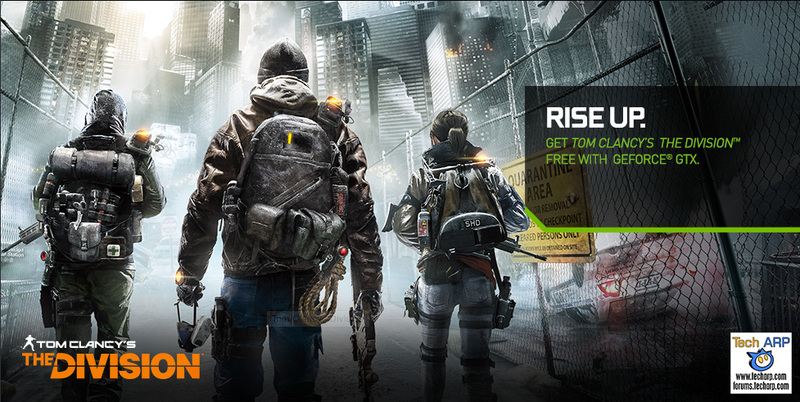 If you are buying an eligible GeForce GTX GPU, system or notebook please ensure the seller is participating in the Tom Clancy’s The Division GeForce GTX bundle; NVIDIA cannot provide download codes and coupons for purchases made at non-participating retailers and e-tailers.